The Legend of Zelda: Skyward Sword was just released for the Wii on November 20, 2011. The game was developed by Nintendo's EAD studio, and it was of course published by Nintendo. The Legend of Zelda: Skyward Sword is the Wii's first exclusive Zelda title for the system, as Twilight Princess was also available and basically developed for the GameCube, and Skyward Sword received an ESRB rating of "Everyone 10+" with "Animated Blood, Comic Mischief, Fantasy Violence" listed as content for parents and gamers to be aware of. How many hours have Wii owners reported playing The Legend of Zelda: Skyward Sword since it released? Let's take a look! The Legend of Zelda: Skyward Sword already has 10,489 Wii owners that have reported game-play data through the Nintendo Channel, with only 8 days possibly reported. 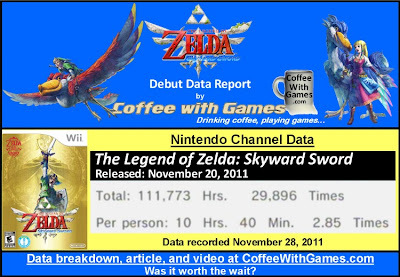 Skyward Sword's average play-time per day/session played is currently 3 Hours 44 Minutes! 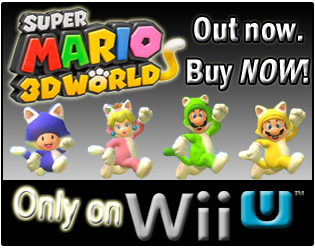 Nintendo published/distributed two versions of the game. One version was the software only version with , which has a MSRP of $49.99, the other version was bundled with a special/limited edition Gold Wii Remote Plus with Triforce Symbol with a MSRP of $69.99. For Skyward Sword to debut on the Nintendo Channel only 8 days after its release is super fast, like other Nintendo first party titles, as most Wii games take at least a full 2 weeks to appear, if not much longer. I think it will be very interesting to see how The Legend of Zelda: Skyward Sword's hours continue to increase, and where the average hours "Per person" end up in a few months. Seeing Skyward Sword's average play-time hours per day/session reported played at nearly 4 hours makes me think the average hours "Per person" will increase pretty significantly each week over the next 2 months, as more Wii owners get the game and play it through to completion, and then perhaps as sales slow down for the title after the Christmas holiday. I have not played The Legend of Zelda: Skyward Sword, and I am currently debating on whether to add it to my Christmas list or not, based on the fact that I only played through Twilight Princess once. If I do end up with the game though, I will definitely share my thoughts on it. Have any of you been playing The Legend of Zelda: Skyward Sword? If so, what do you think of the game from what you have played? Was it worth the wait? If you have already completed it, do you see yourself playing through the game many times, or is once enough? If you are interested in The Legend of Zelda: Skyward Sword, you can see both versions of the game on Amazon.com linked below, as well as a hat you can wear to make you feel even more like Link when playing the game! I got the game on the 20th of November when Target opened and have played pretty much everyday except on Thanksgiving when I was sneezing. I have made it past the 3rd dungeon and am taking my time with it now. I like it so far. I hope to get 100% of it done when I am finished with it. I will likely play it again once I beat it but I may rush through it more then I have the first playthrough. Still waiting for Nintendo to give me my packing slip e-mail so I can send in my Wii for repair (finally). I bought the game though and am counting the days to play it. BTW, how did you get the banner and other Amazon links to show up on your blog? I put in the HTML code for the widget, and it doesn't show up. I don't think I've loaded up the Nintendo Channel since I got the game; would add 12 hours to the total, if I did. I don't usually play Legend of Zelda games more than once, at least not during the same system generation, however, I've done it with both Phantom Hourglass and Twilight Princess (if you consider it Wii generation). I started Twilight Princess just to see if I would have a better opinion of it, as well, but this was no where near the release of Skyward Sword. Nothing really changed for the better or for the worse with that, and I ended up stopping maybe 60% through it. Then leading up to Skyward Sword, I thought I'd just finish up that last bit of Twilight Princess. I honestly don't remember much of Majora's Mask (but tried to play it on the N64 recently to jog my mind; darn thing keeps freezing during the first dungeon), I don't think back on Wind Waker with fondness (though don't really remember much but being troubled by sailing and that penultimate task of triforce shard collecting), and re-playing Twilight Princess reaffirmed my memories of it. I said that to say; I didn't have high-hopes for Skyward Sword. Spirit Tracks seemed like it was probably a bit of a glorious fluke, having a new director (or was it producer....). But, things are going well so far. Exceeding my low expectations quite deftly. I don't want too speak too soon since there is much left to do. Thanks for checking in! Sorry, the comment section was a little crazy on me the last week, as I was switching it over to a new account. Have you progressed any further than the 3rd dungeon now? Also, what do you think of the controls in the game from what you have played? Did Nintendo get you the mailing slip yet? 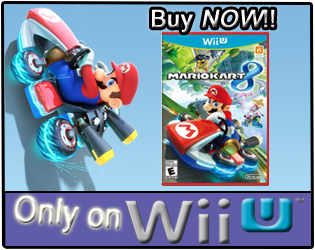 As for the ads, I have been doing a lot of custom ads on my own, meaning I edit the images and all. Right now though, I just switched back (2 days ago) to the older ad service I was using. I'm always changing stuff around, but once you are with Google Ads, or whatever service, they will provide you with the HTML that you put in the box, and it should show up basically immediately with ads. Thanks for the thoughts! The fact I only played/beat Twilight Princess once, is one reason I'm holding off on adding Skyward Sword to my Christmas list. I did the same with Super Mario Galaxy when I received it one year for Christmas; beat it, and never really touched it again. I can't remember, but did you already own a WM+ unit before Skyward Sword released, or did you get it with the game? Like I asked Daniel, what do you think of the controls from what you have played so far? Thank you all for the comments/feedback, and hopefully you are still enjoying your time with the game...and hopefully you haven't encountered the game-breaking glitch! 2011's Video Game Turkey Award! GameStop's - Buy 2 Used, Get 1 Free Sale! The Wii's Most Played FPS by "Total Hours" Is? I Drank Coffee from a Toilet, and Will Continue! Kirby's Return to Dream Land Sold Out?